"No step in denture construction should be stopped short of perfection yet many dentures are worn, which have imperfections built into them, provided they have peripheral seal sufficient to hold them in place". In the large maxillofacial defects and in severely resorbed edentulous ridges, there is a decreased denture bearing area for support, retention and stability. Increase interridge space compounds this problem. To decreased the leverage forces, reduction in the weight of the prosthesis was recommended and was also found to be beneficial. 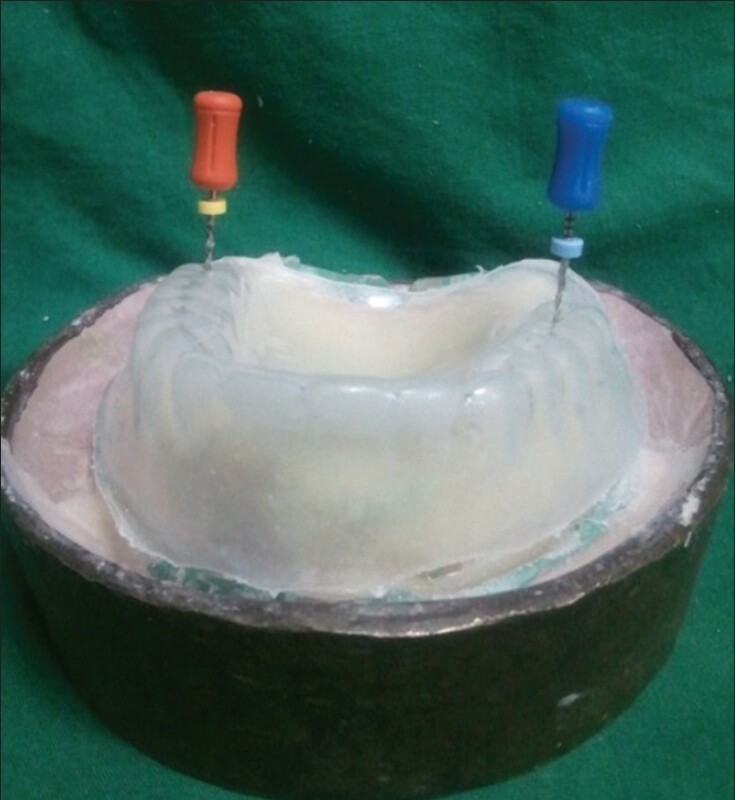 , Different weight reduction approaches have been achieved using a solid 3 dimensional spacer, including dental stone, ,,,,, cellophane wrapped asbestos,  silicone putty  or modeling clay  have been used during laboratory processes to exclude denture base material from the planned hollow cavity of the prosthesis. Fattore et al. used a variation of the double flask technique for obturator fabrication by adding heat polymerizing acrylic resin over the definitive cast and processing a minimal thickness of acrylic resin around the teeth using a different drag. Both portions were attached using a heat polymerized resin. Holt et al. processed a shim of indexed acrylic resin over the residual ridge and used a spacer, which was then removed and the two halves luted with autopolymerized acrylic resin. The primary disadvantage of such technique is that the junction between the two previously polymerized portions of the denture occurs at the border of the denture, which increases risk of seepage of fluid into the denture cavity. Another disadvantage is that it is difficult to gauge resin thickness in the cope area. O'Sullivan et al. described a modified method for fabricating a hollow maxillary denture. A clear matrix of trail denture base was made. The trail denture base was then invested in the conventional manner till the wax elimination. A 2 mm heat polymerized acrylic resin shim was made on the master cast using a second flask. Silicone putty was placed over the shim and its thickness was estimated using the clear template. The original flask with the teeth was then placed over the putty and shim and the processing was done. The putty was later removed from the distal end of the denture and the opening was sealed with autopolymerizing resin. 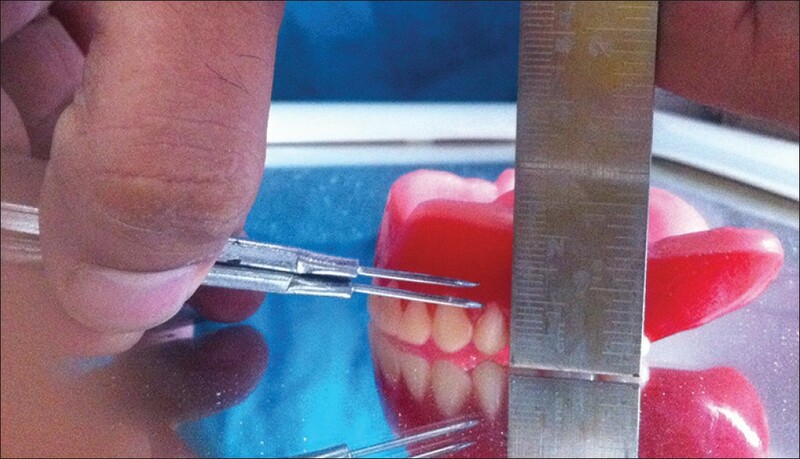 This case reports describes three technique for fabrication of a hollow maxillary complete denture in a patient with resorbed maxillary and mandibular ridges and increased interridge distance. 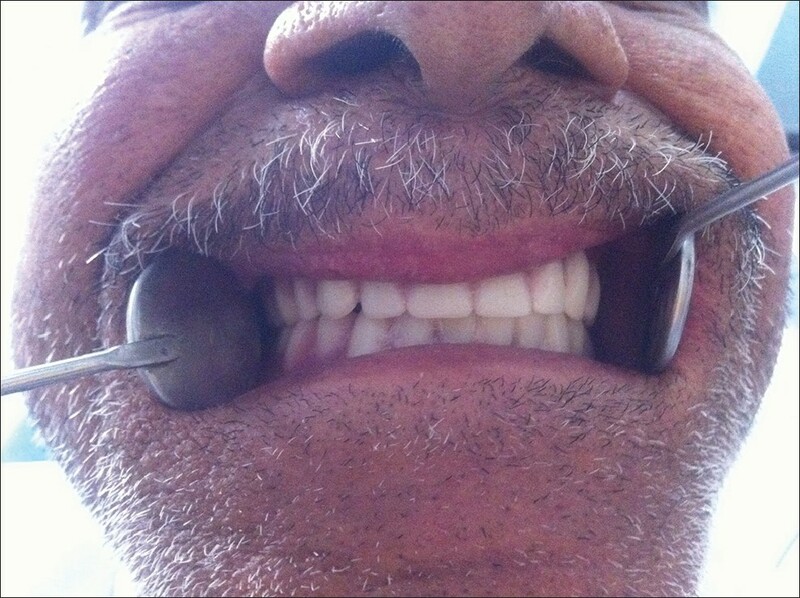 A 59-year-old male patient reported to the Department of Prosthetic Dentistry of Institute of Dental Sciences, Bareilly, Uttarpradesh for prosthetic rehabilitation of maxillary and mandibular edentulous ridges. Patient medical history was not significant. Past dental history revealed that patient was a denture wearer since 4 to 5 years, and the maxillary denture were loose. Intraoral examination revealed severely resorbed maxillary and mandibular edentulous ridges with increased interridge distance. Hence, hollow maxillary complete denture and conventional mandibular denture was planned for this patient. 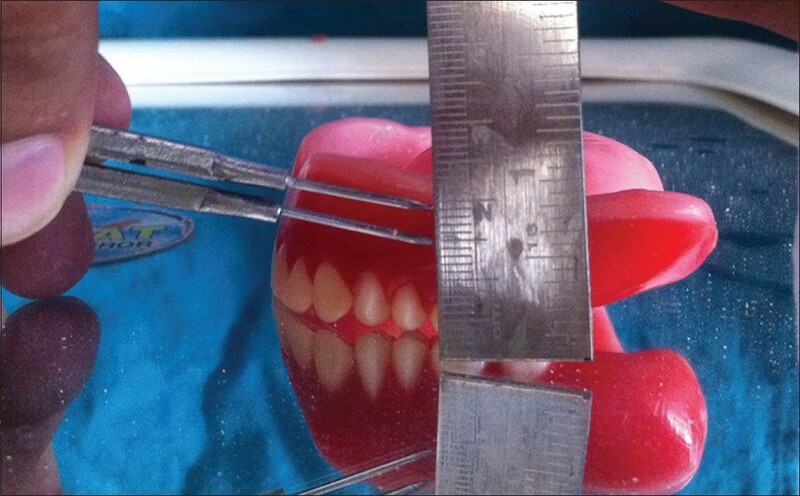 Keeping in mind the strength of the denture, the distance from the teeth to 3 mm of the denture base was calculated. The rest of the denture base till the border was then calculated, therefore, the spacer would occupy the area between the shim of 2 mm thickness and the teeth with 3 mm of the denture base [Figure 1] and [Figure 2]. Till the tryin stage the denture is fabricated in conventional manner. The land area of the cast was indexed using a conical bur and the trail denture was sealed to the definitive cast. The trail denture was duplicated in reversible hydrocolloid and poured in die stone. A template of the duplicated trail denture was made by adapting 1 mm thermoplastic sheet on the recovered cast using vacuum heat-press machine [Figure 3]. Two split denture flasks with interchangeable counters were used for processing. 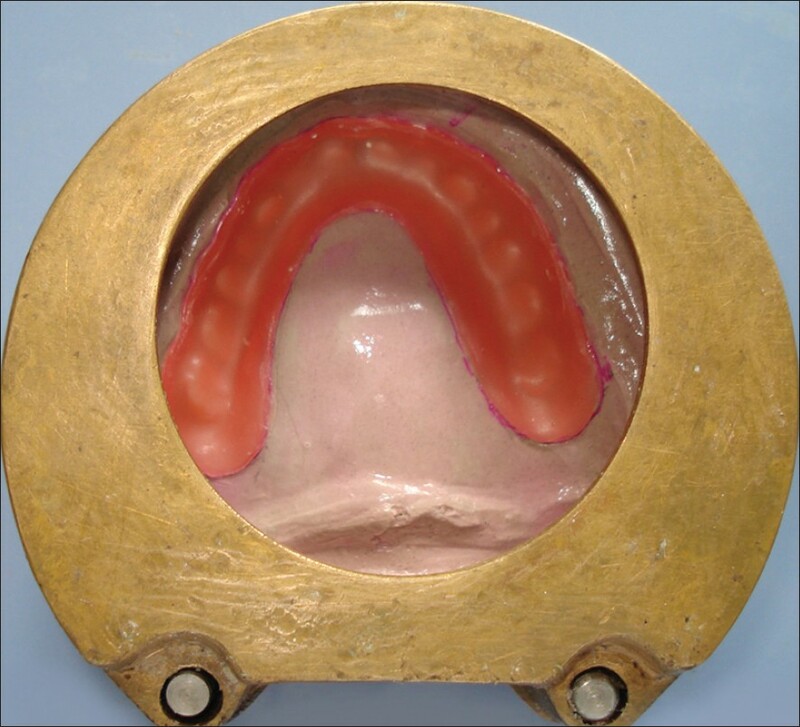 The trial denture was then processed in the standard manner up to the wax elimination stage in base 1 counter 1 flask. With the wax shim, 2 sheet thickness of base plate wax were adapted to the definitive cast in the drag, conforming to the border extensions. A second flask (counter 2) was used to pour this base plate wax and processed in the conventional manner using clear heat cure acrylic resin. After deflasking, the clear matrix was placed on the definitive cast (base 1) using the indices in the land area as seating guides. An endodontic file with the rubber stop was used to measure the space between the matrix and the processed base, in order to ensure that there is adequate space between the resin and the teeth [Figure 4]. Vinyl polysiloxane putty was mixed and adapted on the base 1 and shaped to the approximate contours of the matrix. The polymerized putty was shaped with a bur to leave 2 to 3 mm of space between denture base and matrix so that a hollow space is created. An additional, 1 mm space was provided over the tooth portion of the denture. The putty was fixed to the base using cynoanocrylate [Figure 5]. The original cope (counter 1) was reseated on the drag (base 1) and verified for a complete closure of the flask. Then acrylic resin was packed over the polyvinyl siloxane putty and processed. The processed denture was recovered in the usual manner. After finishing the denture, two openings were cut with a bur into the denture base distal to the most posterior tooth. The silicone putty was removed using a sharp instrument and a thick orthodontic wire. The opening was widened as necessary, to facilitate the access. After complete removal of putty, two covers were fabricated using clear autopolymerizing resin. The clear resin cover was attached using autopolymerizing resin. 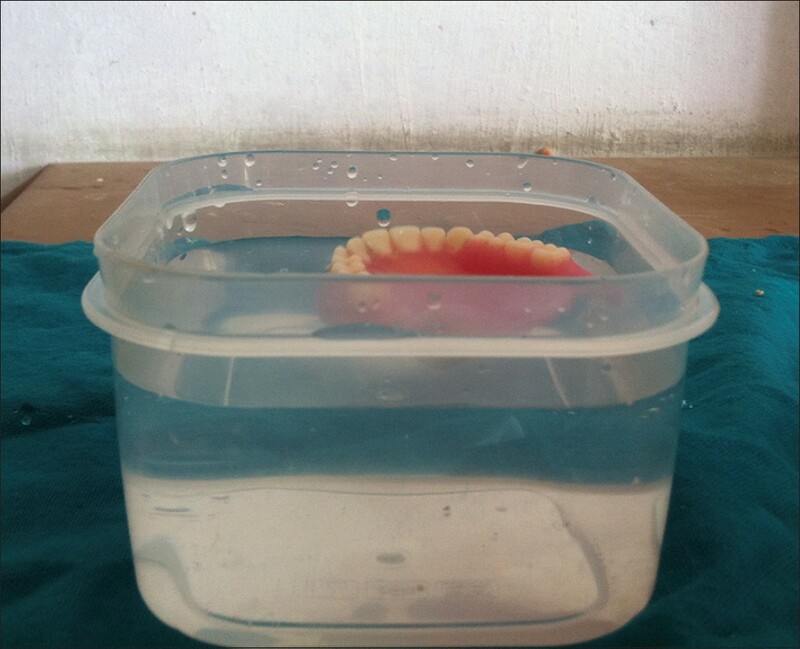 The denture was polished in usual manner and the seal was verified by immersing the denture in the water (air bubbles should not be evident after immersing the denture in the water) [Figure 6]. 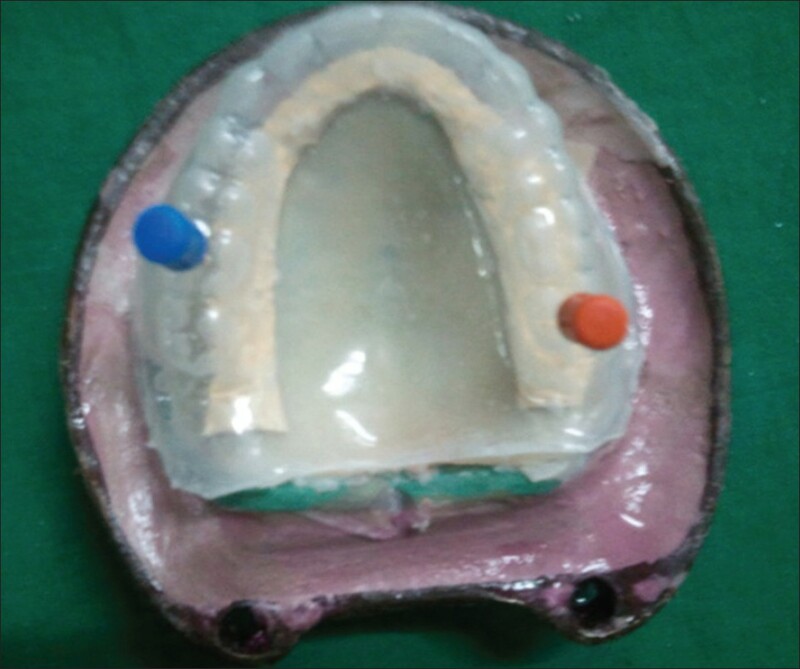 For the second patient with resorbed maxillary and mandibular ridges with increased interarch distance, was treated with a lightweight maxillary hollow denture, using thermocol, a common packing material, as spacer. Two split denture flasks with interchangeable counters were used for the processing. 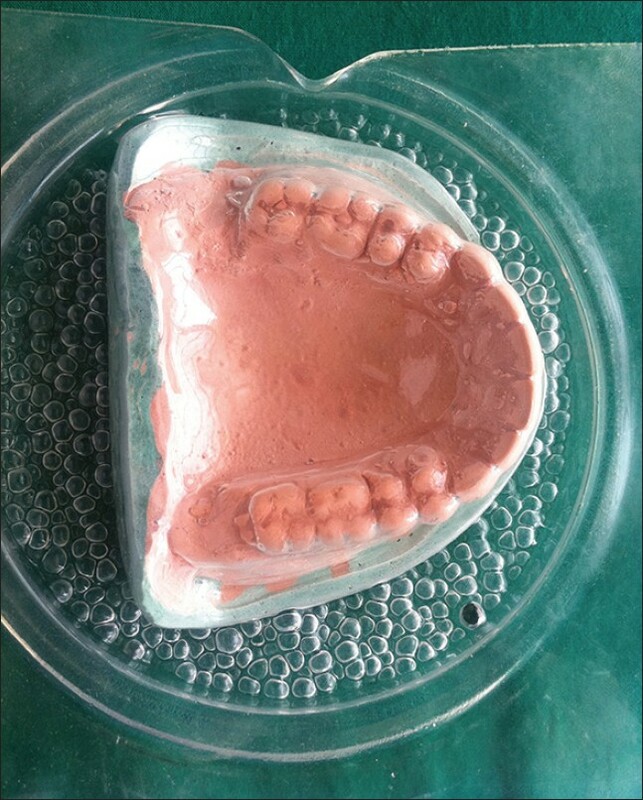 The trial denture base was invested and the processing was carried out till the wax elimination stage. Two layers of hard base plate wax over the definitive cast in the drag (base 1) conforming to the border extensions was added [Figure 7]. A second flask (counter 2) was used to invest the base plate wax till wax elimination stage and the cope (upper half of the flask or cavity side) was packed and processed with heat polymerizing resin. The second flask (base 1) with the polymerized acrylic resin shim of 2 mm attached with the drag was separated. A denser thermocol was placed over the bur roughened acrylic shim along the ridge and luted with cyanoacrylate [Figure 8]. The spacer thickness is modified according to the calculation done above, leaving 3 mm from the teeth to the denture base. The original cope (base 1) over the drag (counter 1) was reseated and complete closure of the flask was verified. 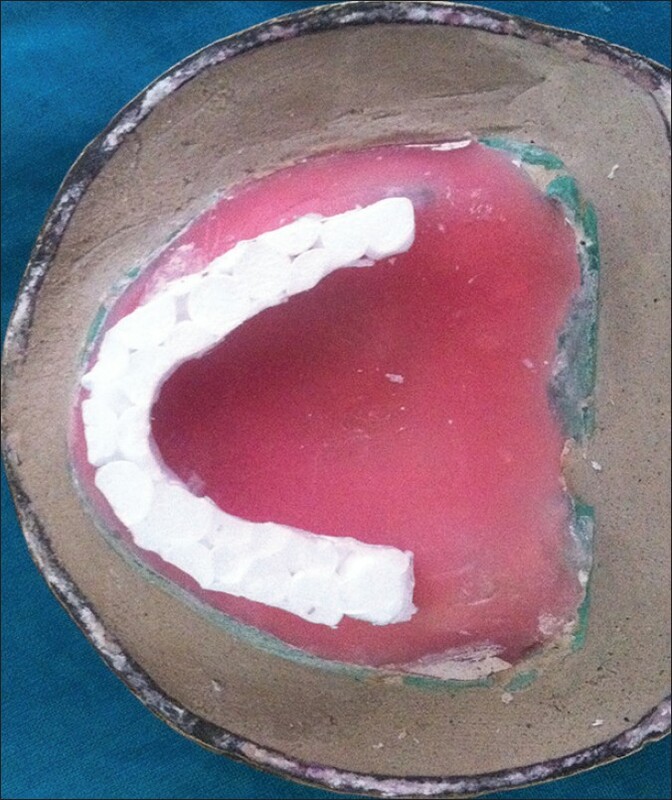 The heat polymerizing resin was then mixed, packed and processed at 74°C for 7 to 8 h. Pre-insertion occlusal corrections were made and the denture was inserted in the patient mouth [Figure 9]. Reduces weight of the prosthesis which in turn enhances retention. Removal of putty from the cavity is difficult. Hollow maxillary complete denture considerably reduces the weight of the prosthesis, which in turn prevents transmission of the detrimental forces, which would otherwise be transmitted from a conventional heavy prosthesis to the underlying tissue and bone. Thus, it helps to preserve underlying tissue and bone. Also, the clear matrix of the trial denture helps to facilitate the shaping of putty spacer to ensure even the thickness of acrylic to resist deformation and prevent seepage of saliva into the cavity. A simplified technique for fabricating light weight maxillary dentures using Thermocol as spacer and putty as a spacer that can be left in the denture without compromising denture strength has been described. 1. el Mahdy AS. Processing a hollow obturator. J Prosthet Dent 1969;22:682-6. 2. Brown KE. Fabrication of a hollow-bulb obturator. J Prosthet Dent 1969;21:97-103. 3. Chalian VA, Drane JB, Standish SM. Intraoral prosthetics. In: Chalian VA, Drane JB, Standish SM, editors. Maxillofacial Prosthetics: multidisciplinary Practice. Baltimore: Williams and Wilkins; 1971. p. 133-57. 4. Fattore LD, Fine L, Edmonds DC. The hollow denture: An alternative treatment for atrophic maxillae. J Prosthet Dent 1988;59:514-6. 5. Gardner LK, Parr GR, Rahn AO. Simplified technique for the fabrication of a hollow obturator prosthesis using vinyl polysiloxane. J Prosthet Dent 1991;66:60-2. 6. McAndrew KS, Rothenberger S, Minsley GE. 1997 Judson C. Hickey Scientific Writing Awards. An innovative investment method for the fabrication of a closed hollow obturator prosthesis. J Prosthet Dent 1998;80:129-32. 7. Nidiffer TJ, Shipman TH. Hollow bulb obturator for acquired palatal openings. J Prosthet Dent 1957;7:126-34. 8. Worley JL, Kniejski ME. A method for controlling the thickness of hollow obturator prostheses. J Prosthet Dent 1983;50:227-9. 9. Holt RA Jr. A hollow complete lower denture. J Prosthet Dent 1981;45:452-4. 10. Jhanji A, Stevens ST. Fabrication of one-piece hollow obturators. J Prosthet Dent 1991;66:136-8. 11. O'Sullivan M, Hansen N, Cronin RJ, Cagna DR. The hollow maxillary complete denture: A modified technique. J Prosthet Dent 2004;91:591-4.